The Wheel of FORTUNE just concluded an interview, part of SA partnership with Cheddar TV to produce a Seeking Alpha “Idea of the Month” slot. These interviews are always a challenge because i) they are very short in nature (only 4-5 minutes), and ii) since it’s live TV we are dealing with – you may get cut even shorter than you thought. While you intend to present a complete case for a compelling idea, in many cases you don’t get enough time (and space) to express much more than the headline and, more or less, nothing else. 1. “Time Warner And AT&T Both Worth Buying” (November 23rd, 2017) – this interview followed a blog post tip that we published three days earlier. 2. “Target A Hold” (January 21st, 2018) – this interview was followed by a more detailed article – “The Best Way To Aim At The Target For The Next 12 Months” – that laid out the entire strategy, something that the interview can’t do. Just like the previous interviews, I find it important to attach a detailed and thorough written plan for the short insufficient verbal message. 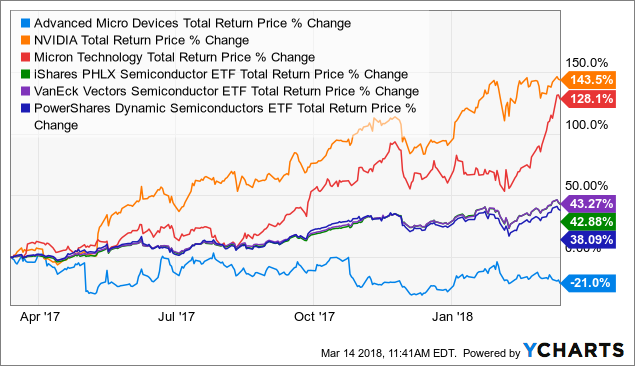 I already covered the semiconductor segment (“semis”) in the past and those who follow me know that we’re currently long Advanced Micro Devices (AMD), Nvidia (NVDA) and Micron Technology (MU) with AMD being our top pick for 2018. In this article we will discuss this trio of semis with the emphasis being on how to play this game rather who to play it with. 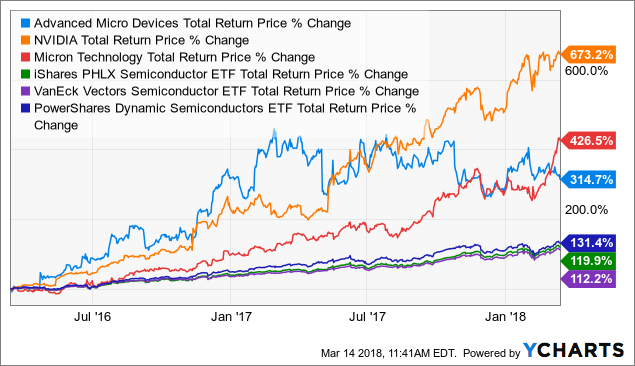 NVDA the clear winner but AMD the clear laggard? Since 12/12/2017, when we purchased it at $9.90/share, AMD has done pretty well. However, as is the case with almost anything in life, it’s all relative. Until the recent market correction started, AMD was actually leading the trio with a gain of 40% at the peak (AMD traded as high as $13.85 on 1/31/2018). 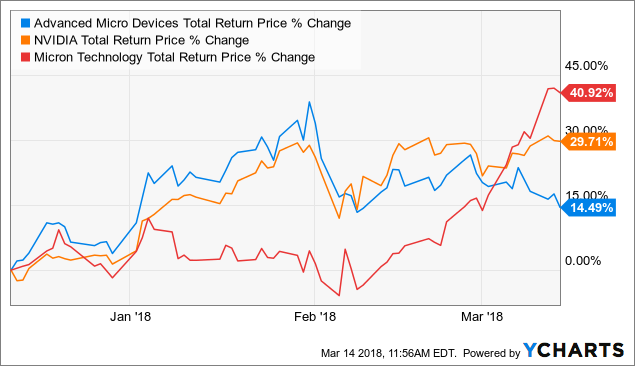 Nonetheless, since mid-February – when the correction was over – AMD hasn’t been able to regain its strength with both NVDA and especially MU (with an over 60% gain since it traded as low as $37.52 on 2/9/2018) outperformed significantly. Semis was the hottest segment on the market over the last couple of years. Unlike what many may think, AMD is not a long-standing laggard. If we take a closer look at longer periods (1-5 years) we get an interesting picture with one common denominator: NVDA has outperformed anything and everything during each and every period. MU is giving NVDA a lot of competition but NVDA is still winning the race easily. AMD looks quite awful. NVDA is the clear winner. 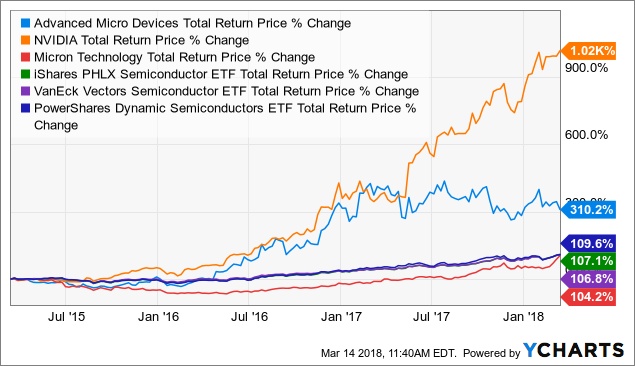 Although MU has outperformed AMD, both stocks have outperformed the benchmarks massively. Once again, NVDA is the clear winner with over 1000% total return. Guess what? AMD has significantly outperformed MU, delivering x3 the total return that MU delivered. Have we said NVDA already? Five years and almost 2000% total return. Completely off the chart. MU is back, outperforming AMD easily. Point is that while NVDA is the clear (past performance) winner, the battle between AMD and MU isn’t a decisive one. Much of MU outperformance is attributed to the incredible last five-week run. Without this over 60% run, MU would be the clear laggard among this trio. 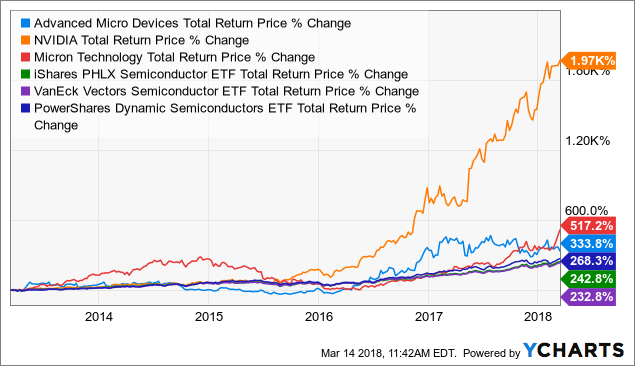 So before you trash AMD as being the worst pick among this trio – keep in mind that this is very much depends on the time frame and exact holding period of each investor. Reasons to Keep Being Hot on the Segment Numbers don’t lie. Results (for Q4/2017) for NVDA and AMD and guidance (for Q1 and/or FY 2018) of all three (including MU) were great. Take a look at the numbers (below) and you’ll see a segment that’s hitting on all cylinders. As a matter of fact, in some areas this may only be the beginning of a new 15-year cycle, part of a tectonic shift (see hereinafter). M&A activity. Rumors regarding an AMD takeover have circulated around trading desks lately. M&A activity may intensify in light of the Broadcom (AVGO) failed bid for Qualcomm (QCOM) and (in a funny way) especially following Trump blocking the proposed takeover on security grounds. Virtual Reality headset boom. Let me share with you a recent personal experience: Last week I visited the Tate Modern museum in London to enjoy the most comprehensive exhibition of Modiglianis work ever held in the UK. Toward the end of the exhibition, all visitors can enter a virtual reality room that bring them closer into the artist’s world, enriching their understanding of his life and art. VR headsets provide an immersive layer of interpretation as visitors are invited to step into early 20th Century Paris. Drawing on archival material and new research, the experience recreates aspects of Modiglianis adopted city, bringing his historical context to life. 1. Even analysts find it hard to keep up with the pace of rising prices. Price targets for both NVDA and MU are below the levels where their share prices are. We presume that analysts will lift their PT soon. Nevertheless, MU’s golden time is expected to peak in FY 2018 and then after it might be downhill. While NVDA’s growth is superb, AMD’s bottom line is expected to grow much faster percentage wise. 5. AMD’s profit margins are substantially lower than its peers. While AMD margins are in the mid 30s those of NVDA and MU are north of 50%. We believe that this large gap will eventually get closed as AMD (only now) becomes more competitive. Note that AMD’s most recent guidance for FY 2018 (double-digit growth in revenue and a 36%-plus gross margin) was above market expectations. See why we like AMD? It’s the best risk/reward play out of the trio right now. We believe that AMD’s business model – after the company’s been building a competitive line of products/services (e.g. EPYC, Ryzen, and Threadripper) has a sustainable path toward both top and bottom line growth. Specifically, data-center star EPYC is ramping up with HP Enterprises (HPE) and Microsoft (MSFT) but still (admittedly) at an early stage. Investor focus should be on data traction and, as mentioned above, gross margin improvement (toward the 50% mark) in the mid to long term. It’s clear to us that AMD also is going to take market share from Intel (INTC). A recent leak reveals that Ryzen’s second-generation chip is going to the fastest chip AMD ever produced. Yes, we are fully aware of the recent allegations that there are (allegedly) 13 vulnerabilities in AMD’s Ryzen and EPYC chips. Based on the way this has been communicated, the (mystery) entities that are behind the report (apparently short sellers) and the 24-hour the company has been given to respond to the “findings.” We find these allegations to be baseless. AMD continues to improve execution in high-cost and high-performance products, which positions AMD to take advantage of multiple categories experiencing global momentum, e.g. client and server computing, consumer gaming and electronics, graphics processing, cloud data center, AI, and blockchain. In case you haven’t figured this yet – we love semis. We think this is the past, present and future. It’s hard (and frankly doesn’t make any sense) to argue with the growth and potential here. We like all three names – AMD, NVDA and MU – and we own all three. Having said that, we do like AMD better, mainly because we see it as the better pick from a risk/reward perspective but also because we see a greater potential for AMD to shine in an already shining kingdom. Putting it differently, it will be easier for AMD to beat and perform than its main peers. In part II we will keep up with the trio and come up with a strategy if and what to buy (or sell…), when and how. Stay tuned! The Wheel of FORTUNE is now offering a “March Madness” bargain deal that you don’t want to miss out on! (See TV’s blog post too). Now that Trapping Value is part of The Wheel of FORTUNE you actually get two for the price of one. Both annual and monthly fees are going to rise on April 1st by 5% and 10%, respectively, so make sure you join before Fool’s Day. Joining now ensures that you are grandfathering the current lower fees. In order to make it even more attractive for you, the free trial is now on, so you can take advantage of a two-week, free of charge, first-hand experience before you commit to the service on a longer-term basis. Make sure you read the reviews (128/130 possible stars) subscribers wrote about the service to gain a better understanding of what you may expect out of it. Disclosure: I am/we are long AMD, MU, NVDA. This entry was posted in Stocks on March 16, 2018 by admin.